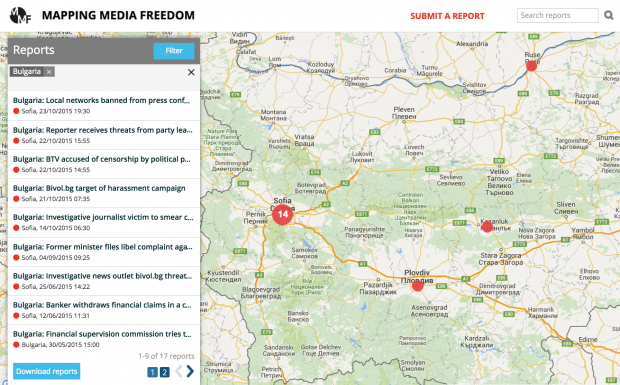 Journalists of the Bulgarian investigative news website Bivol.bg are facing an orchestrated smear campaign that’s unusual even for Bulgaria, the worst-ranking EU member in the 2015 Reporters Without Borders press freedom index. The attacks can be linked to mainstream media outlets controlled by the Bulgarian media mogul and lawmaker Delyan Peevski, and seem to be a response to a number of investigations published recently by Bivol.bg, all involving Peevski in one way or another. “Even if it is not like in the beginning, the smear campaign did not end,” Bivol’s editor-in-chief, Atanas Chobanov, told Index on Censorship in December 2015. During the autumn, articles denigrating Chobanov and Assen Yordanov — Bivol’s founder, co-owner and director — began appearing in media outlets such as the Bulgarian weekly Politika, the Telegraph, Monitor and Trud dailies, as well as the news website Blitz, which are controlled either directly or through proxies by Delyan Peevski, an MP from the parliamentary group of the Turkish minority party, Movement for Rights and Freedoms (MRF). According to a summary published by OCCRP, the articles allege that Yordanov uses Bivol.bg to publish fake stories to blackmail politicians and business people. The attack pieces allege that Bivol.bg publishes stories about environmental issues to serving the interests of fake eco-activists who pose as people concerned about the environment to extract cash from firms that want to build in the Bulgarian mountains and on the Black Sea coast. The pieces give a thoroughly negative depiction of Chobanov, saying that he is greedy, aggressive, mentally unstable, narcissistic, disliked and unwanted. The campaign culminated on 10 October, when a crew of the Bulgarian TV Channel 3, a television where Peevski is a co-owner, showed up at the rented apartment in Paris where Chobanov and his family lives. “I was at the Global Investigative Journalism Conference in Lillehammer, Norway,” Chobanov said, adding that the crew did not try to contact him by phone, e-mail or by any other means in advance. The journalist believes they must have known that he was away because he made a public announcement about his upcoming trip and he was tweeting from Lillehammer. Although Bivol.bg was the target of similar articles in the past, the ongoing campaign started when the investigative news site published proof that Peevski is a shareholder at the Bulgarian cigarette maker Bulgartabac, a former state-owned company that underwent a controversial privatization process in 2011. Then the journalists started publishing a story about the disappearance of €26 million ($28.3 million) from an EU food aid program for the poor, where the majority shareholders of Bulgaria’s First Investment Bank (FIB) were implicated. “After the Bulgarian bank crash, Peevski moved his assets, his credits and deposits to this bank, so this investigation also hurts Peevski’s interests,” Chobanov said. Next, Bivol.bg broke “Yaneva Gate”, a series of stories based on leaked phone conversations between former Sofia City Court president Vladimira Yaneva and fellow judge Roumyana Chenalova over unlawful surveillance warrants that Yaneva had signed. In those conversations, the judges mentioned Peevski by his first name, Delyan. “The Prosecutor General, one of the men of Peevski, is also involved,” Chobanov pointed out, adding that the story provoked an earthquake in Bulgarian politics, causing justice minister Hristo Ivanov to resign. “It is a judicial battle now. We are turning to courts to stop the smear campaign, and we are also defending ourselves from legal complaints filed for the investigations we did in the past,” Chobanov said. Thank God (or whoever) for Bivol. They keep the hope alive.